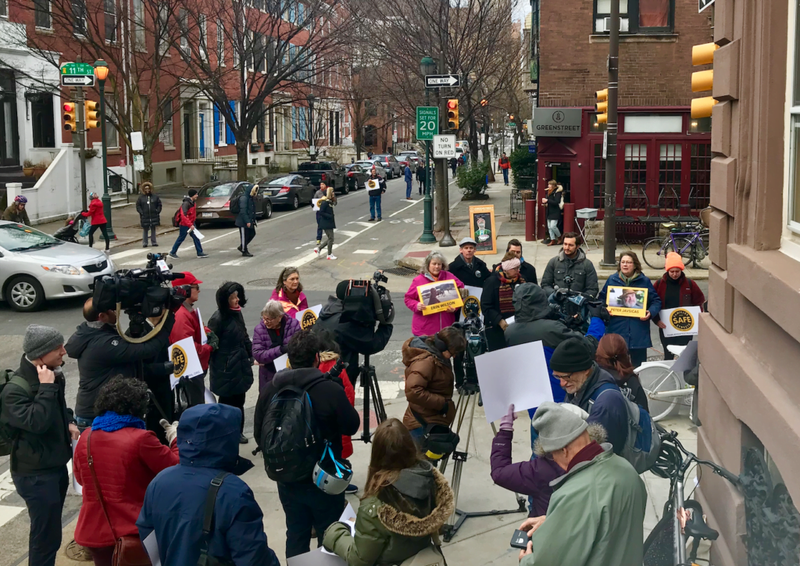 Families for Safe Streets Greater Philadelphia gathered in the cold at 11th and Spruce Streets Thursday morning, outlining a list of demands for the City of Philadelphia and law enforcement, alongside several bicyclists and safe streets advocates. While there, FSSGP founding members Laura Fredricks, Anne Javsicas and Latanya Byrd spoke about the work their organization is currently doing, what they’ve already accomplished, and, most importantly, why they are working to end traffic violence in Philadelphia. As it happens, the driver who killed Emily Fredricks was charged on Wednesday with vehicular homicide, among other crimes related to the crash in November 2017. It was for that reason, and others, that the group chose 11th and Spruce, where Emily was killed, for the announcement. FSSGP will be pushing for more and better installation and maintenance of safe infrastructure in Philadelphia—the fates of thousands of people relies on it, added Fredricks. “On those streets that have seen upgrades, the proper maintenance is an issue we hope to continue to address,” she continued. “Our organization is calling for resources to be directed specific to Vision Zero projects and maintenance. Next, Anne Javsicas, of Mt. Airy, spoke. 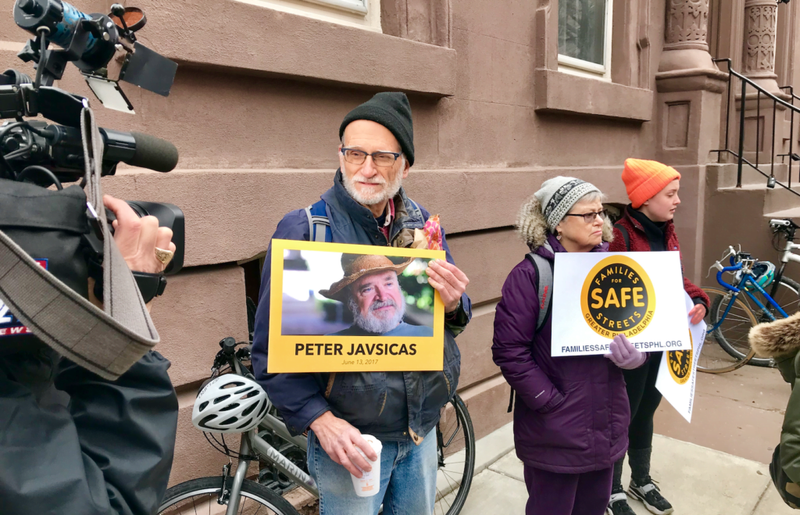 Javsicas’ husband, Peter, was killed while standing on the sidewalk at 16th and JFK Boulevard in 2016. Peter was a long-time transportation advocate and dedicated much of his time to ensure families could age in place in the city. Many of Anne and Peter Javsicas’ friends came to the demonstration for support and solidarity. 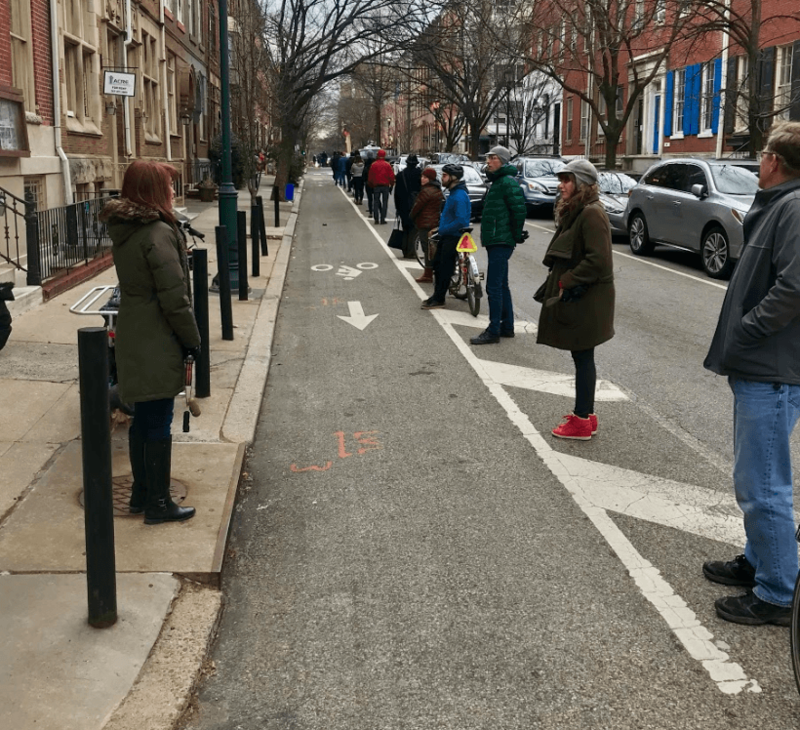 Javsicas spoke of the research conducted by Families for Safe Streets and the Bicycle Coalition of Greater Philadelphia. 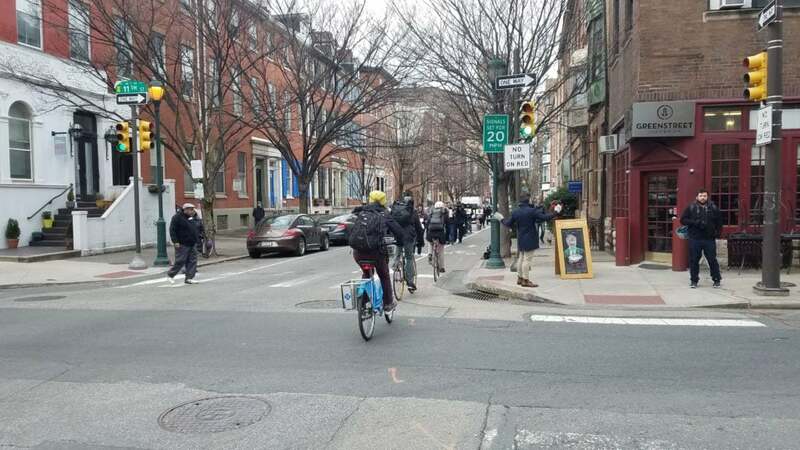 Between 2017 and 2018, she noted, only 16 percent of drivers who killed a pedestrian, bicyclist or motorcyclist was charged in Philadelphia, despite, as in Peter’s case, there being overwhelming evidence that the driver was at fault. The last speaker of the morning was Latanya Byrd. In 2013, Byrd’s niece and three of her niece’s four sons were killed by out of control drag racers on Roosevelt Boulevard. 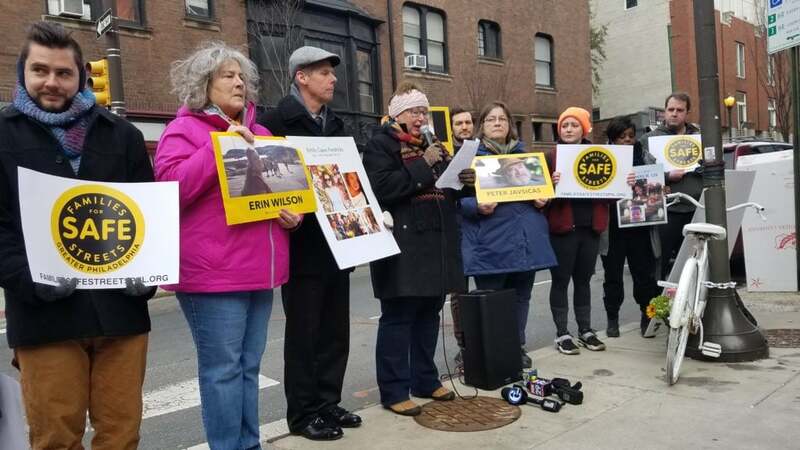 Over the past two years, Byrd has been traveling with the Bicycle Coalition and members of the Vision Zero Alliance to Harrisburg to advocate for speed cameras on the Boulevard. All speaker noted there’s lots of work left to be done. 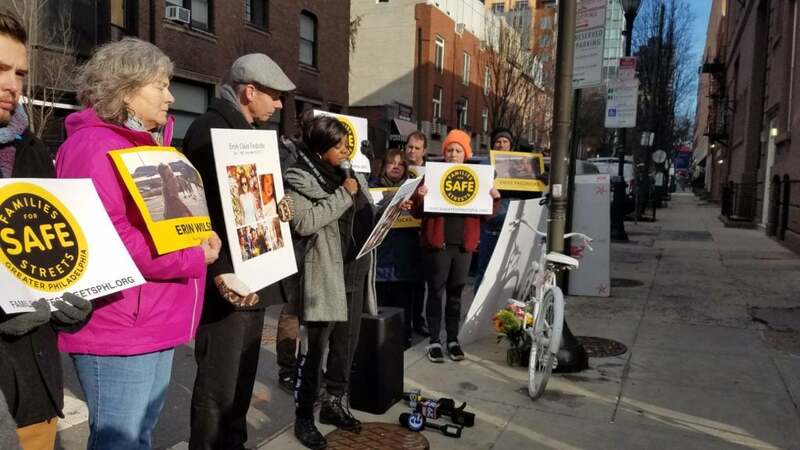 In Latanya’s case, our organization, and pedestrians and drivers all over the region, are still waiting for City Council to pass legislation enabling the automated enforcement on the Boulevard. For more information about Families for Safe Streets Greater Philadelphia, check out FamiliesSafeStreetsPHL.org.